"Mom... why do our pancakes always have to be healthy? 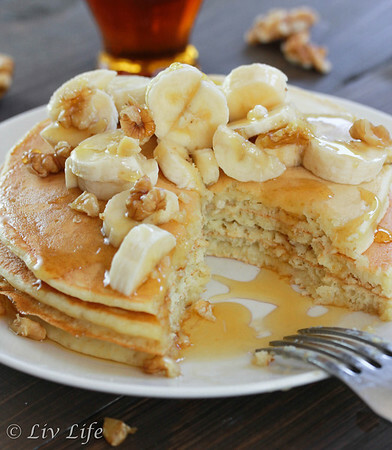 Can't we for once just have plain pancakes?? You know, like the big white ones at restaurants?" Such were the questions Liv posed a few mornings ago as we discussed breakfast. When my son was a baby he lived on pancakes, and over the years I've learned to stuff just about every sort of nutrient possible into those beloved circles of batter. Pumpkin, with its pie-like spiciness, has always been a favorite (and filled with Vitamin A). Our buttermilk version included rolled oats (lots of fiber) and even my most decadent version, the one served with the warm maple glaze, is made with whole wheat flour and bananas (potassium and grains covered here). Fruits of all sorts tend to find their way into the pancakes (Blueberry anyone??) and nuts are a frequent partner. Back to Liv's request for plain restaurant pancakes, and my head filled with visions of packaged pancake mixes (not that there's anything wrong with that) and a plate of few nutrients. On occasion? Not a problem. Referring to a basic recipe from Martha Stewart, I glanced at the ingredients of white flour, granulated sugar and lots of butter and began reaching into the pantry. Somehow my spelt flour came out along with the white flour and my favorite orange blossom honey happened to replace my grasp for the sugar. 1/4 cup of butter? It seemed a generous tablespoon would cover that, and then I might also have added a little flax meal. Stirring the ingredients together, Liv smiled as I asked her to put the all-purpose flour away (I had taken care of the spelt and flax) and she proceeded to give herself a generous pour of maple syrup into her favorite pitcher. Asking for plate sized pancakes, like the restaurant, in place of the smaller sized that I normally do, these beauties puffed up stunningly and had the kitchen smelling like breakfast in no time flat. Serving up a plate-sized double stack, my girl smiled that, "Oh my goodness I can't believe she made plain restaurant pancakes!" smile, and proceeded to clean her plate. 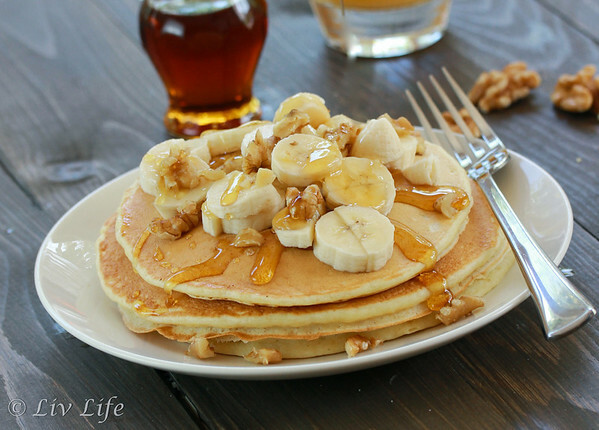 She didn't oppose the banana and walnut topping, and proclaimed these pancakes even better than her favorite plain restaurant versions. I gave her a hug as I tossed another one onto her plate and my heart grew just a little knowing that my girl likes healthier things... she just doesn't know it. Light and fluffy, these beauties are perfect for a leisurely weekend morning, and with a touch of whole grains, protein filled eggs and fragrant honey, mom will feel good serving them. In a large bowl combine the flours, flax meal, baking powder and salt. Whisk to combine. In a medium bowl, combine the milk, butter and eggs. Whisk well to combine. Pour the wet ingredients into the dry ingredients, and top with the honey and vanilla. Stir with a wooded spoon just until combined, adding a Tbs or two of milk if the batter is too thick. Heat a griddle over medium high heat, and spray with cooking spray (or alternatively, rub with the end of a stick of butter). Pour two ladles batter into the middle of the griddle (for plate sized pancakes), or smaller sizes all around the griddle. 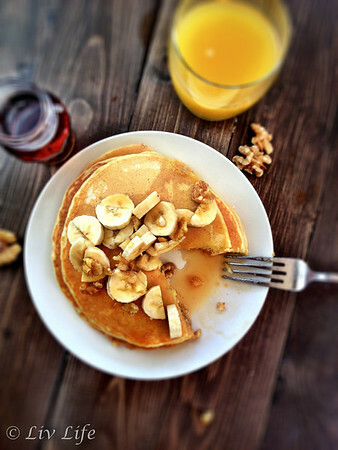 When pancakes bubble and appear set on the edges, flip and cook about two minutes longer. Remove to a plate and proceed with the rest of the batter. I am starving. I love these and you ended up healthifying them in the most delicious way. And she never ad a clue!!! These look so nice and light. I love how you added spelt flour and flax seed! I think she has actually come to prefer her baked goods with some added grains... I like that!! Ohhhhhhh, you tricked Liv! I'm telling! Kudos to you though. We're a pretty big pancake family and I think yours look fantastic. They really stayed super light! Love that...! Lol, I love the questions - I get the same thing from my boyfriend... 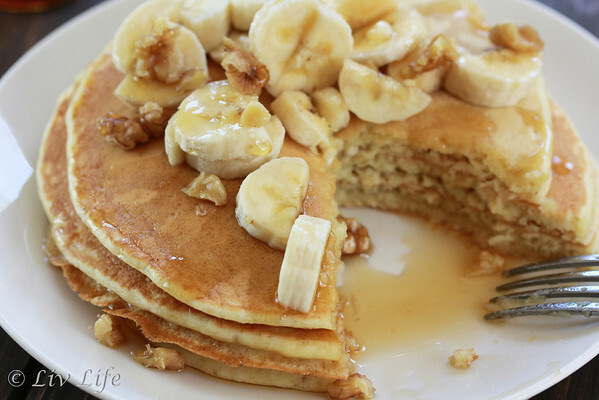 Better yet - I love that these pancakes still sneak healthy ingredients in! Ha! I love that she loved it! !